Creating a native MQTT App provides a convenient platform for complete customization of any IoT project. Yet the effort to develop a Android Studio App can seem daunting. With a huge learning curve just to accomplish the simplest of tasks. To my surprise, however, I found it reasonably simple and easy to create a basic app framework upon which to expand into a full-blown tool for MQTT interactions. For those that just cannot wait, here is the project. You can even install the apk file app-debug.apk on your Android device now. This was as easy as a google search and file download. 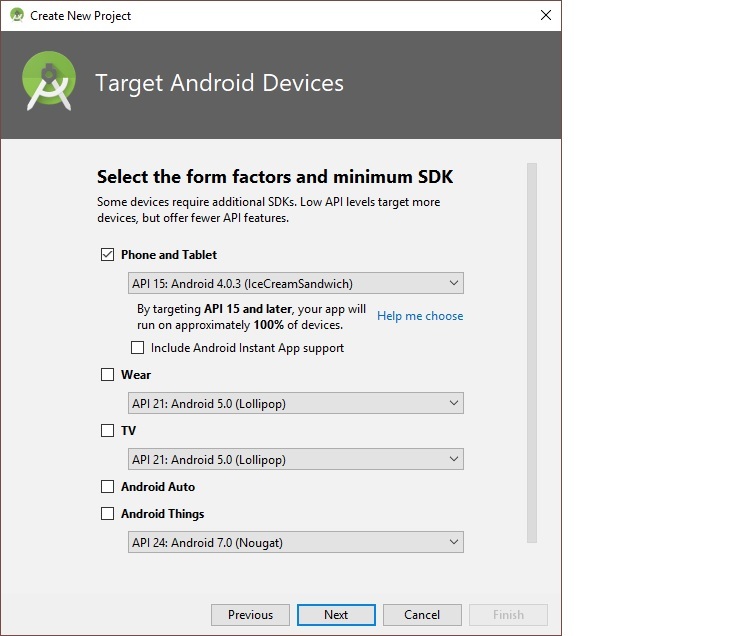 Use this link to install Android Studio on a PC with Windows 10 operating system. Next, Select “Bottom Navigation Activity”. 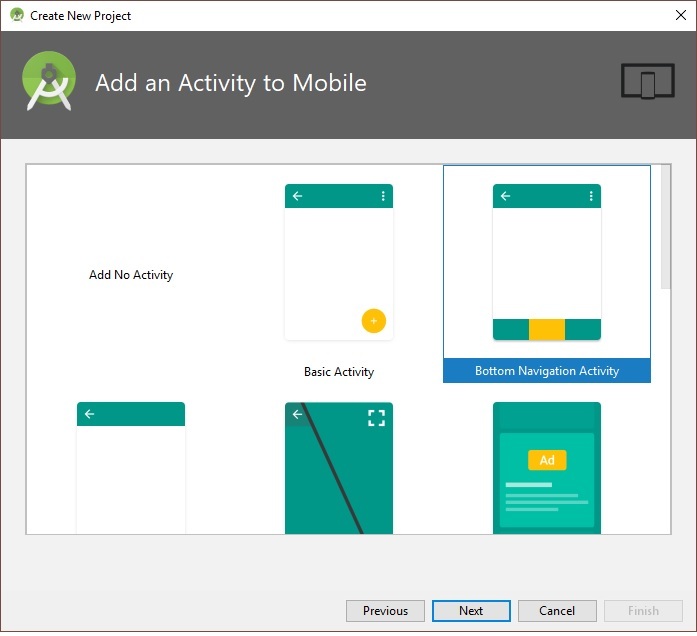 Click “Finish” to complete the App framework creation. The demo App will build. 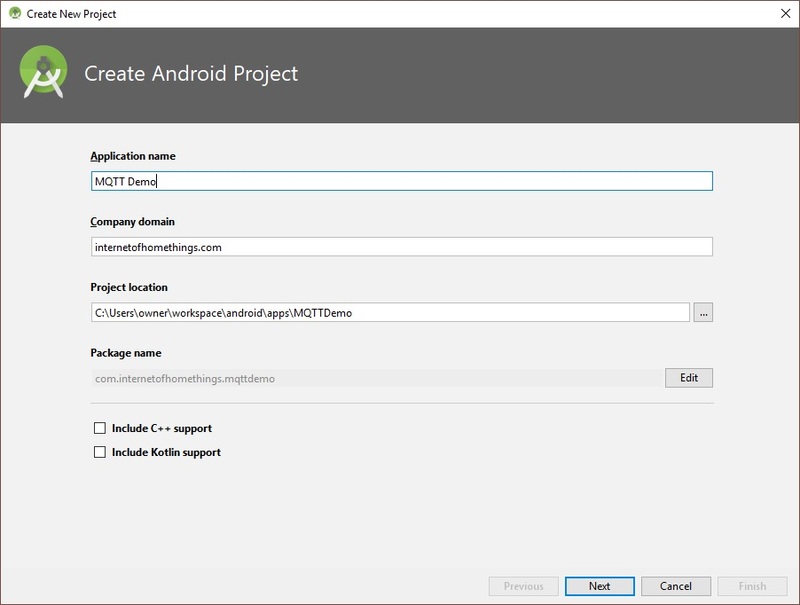 Before we add the code for MQTT, it would be a good idea to build the apk and install the app on your android device to make sure the framework is functional. Select Build-> Build APK(s) from the menu. Now lets add the MQTT Demo code. For this exercise, close Android Studio and simply replace the contents of the project folders with the files I have uploaded to Github here. Then we will walk through the code. The build folder contains the output files from the build, libs contains the paho MQTT libraries, and src has the source code for the project. You can download the paho library files from here. The Paho Android Service must also be added within the manifest <application> tag. A preview of the GUI can be seen by selecting the “Design” tab while the xml code needed to generate the GUI can be edited from the “Text” tab. While not necessary, inn order to make it easy to follow, the GUI components are listed in the xml file in the top-to-bottom order that they appear on the screen. Note that this object has a defined width and height of 0px, making it invisible. This object is used to set initial focus when the App is opened. Without this object, the app sets focus on the first editable field and the edit alphabet pop-up appears, somethings that is clearly undesirable on start-up. This object is the large white space in the layout above. It displays MQTT messages as they are received. This object is the tabular information on the bottom half of the screen. This table is used to input MQTT connect parameters and to display the connect status. This object is the icons and text along the bottom of the screen. Upon tapping, these items trigger action by the app. This file defines the five navigation items displayed along the bottom row of the screen. Three fields are needed for each item. The startup and callback code is contained in the MainActivity.java file. A separate file is needed for each app scree. Since this demo app only uses 1 screen, only 1 file is needed. 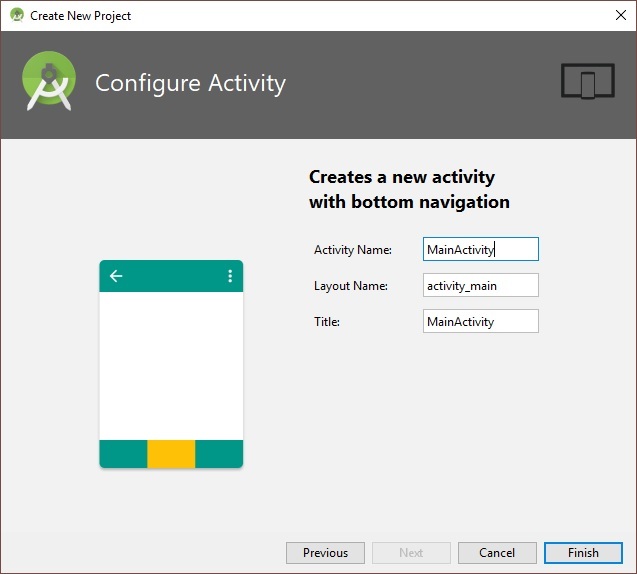 The App code (class Methods) are contained within the MainActivity class. <strong>OnNavigationItemSelectedListener</strong> - Callback executed when a bottom navigation item is tapped. The bottom Navigation menu callback is registered. This App only requires one scheduled task. The app checks to see if the MQTT client is still connected to the broker. If connected, the display says “Connected” in green text. If the connection is lost, it displays “Disconnected” in red text. Button 2: Subscribe – If connected to the broker, a subscription to the topic entered in the table is made. But if not connected, a message is displayed indicating a subscription cannot be added unless connected to the broker. Button 3: Publish – If connected to the broker, the message entered is published to the topic entered in the table. But if not connected, a message is displayed indicating a message cannot be published unless connected to the broker. Button 4: Clear – Erases the content of the message window. Button 5: Exit – Exits the App. The code executed when a subscribed message is receive is structured as if/then conditional statements. Once condition is executed for each unique topic executed. This provides a mechanism to execute topic specific code. But in this demo App, the specified unique topics are not used. In that condition, the default “else” case is executed, which simply echos the published message in the message window. With the App framework presented, a full-featured app can be developed to interface with an MQTT broker to monitor and control your IoT devices. 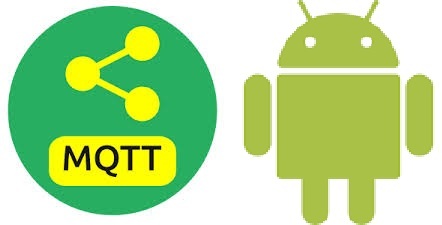 It can also be used as a client to test out MQTT clients connected to a common broker. Once again, the project can be downloaded from Github here. Hope you find this project useful.